Cycling luxury at its finest: the Assos Cento EVO8 Short Sleeve Jersey is set to introduce you to a world of comfort and performance on the bike unlike any other. This jersey offers you a deluxe feel, with unbeatable climate control, along with great stretch, a dreamy comfortFit, and a total absence of irritations or distractions. No detail is neglected either, with seam-reducing collar and pocket design; lighter, seamless sleeves with ideal freedom of movement; and Super Level pockets that have been laser cut for ventilation of the back. Have a Good Ride. 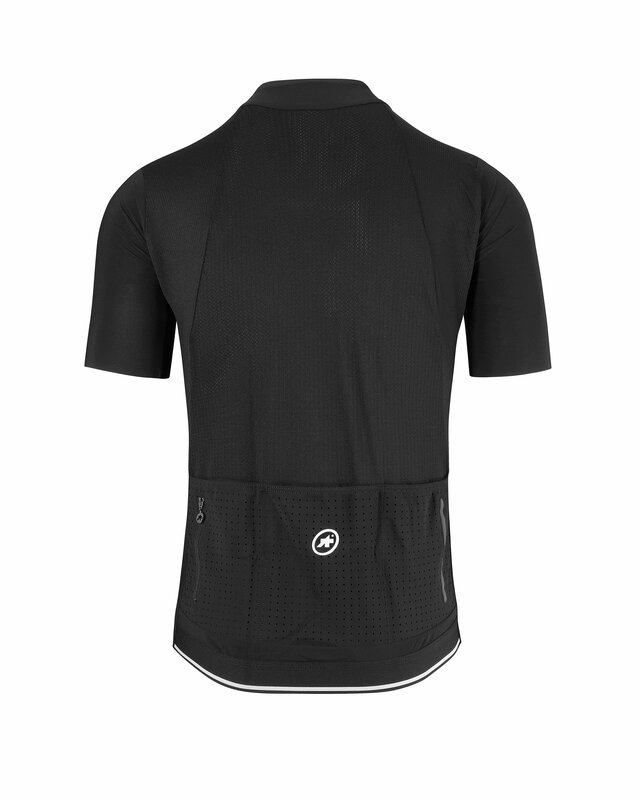 You can expect to feel your best on the bike with the Assos Cento EVO8 Short Sleeve Jersey. And when you’re feeling great there’s no stopping you from riding your best. Regular Fit: A body mapped performance fit that is a little less aggressive than our racingFit. The best of both worlds, wearability and speed converging. Mount Pine Tex: An intelligent knit fabric with an open structure noted for its breathability, elasticity and remarkable temperature regulation. 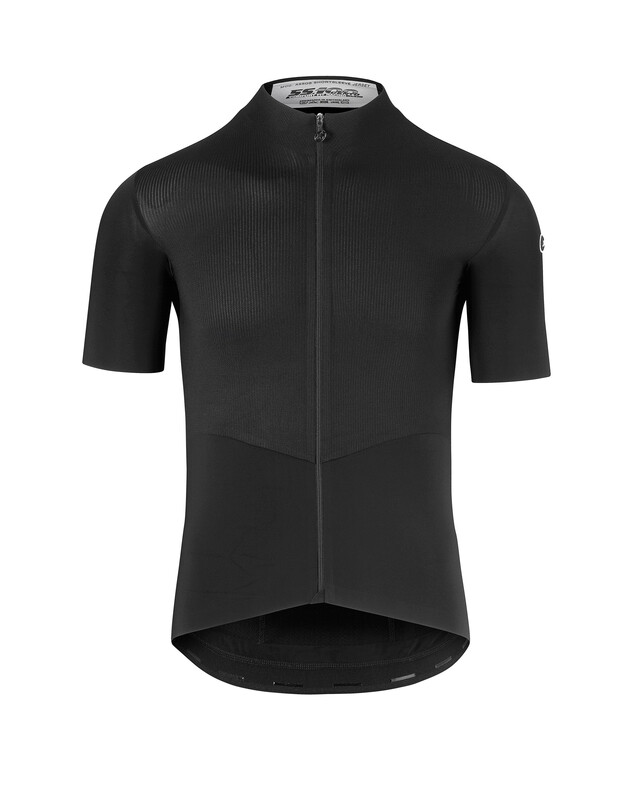 Engineered by the ASSOS fabric experts, it is the benchmark in the cycling apparel industry for climate control capabilities throughout the most extended periods of exertion and at high temperatures. Sens Classic Tex: A lightweight, super-stretch material engineered by ASSOS to improve comfort in areas where elasticity and softness are beneficial. Used here on the arms and the bottom part of the front panel. Stabilizator S7 Knit: Featherweight but strong material, perfect for creating a cooling panel on the back of the cycling jersey. Maintains stability and alignment - and has UPF30 - despite its minimal weight and volume. Seamless raw-cut arms: Comfort led sleeve design with semi-raglan cut for easy, free movement and reduced drag. New collar construction: Redesign which uses a double layer of fabric for ideal fit and frictionless comfort. Patented stabilizer element adds stability while zipping and unzipping the jersey. Super Level pockets: Our insight led placement of the pockets of the rear on the jersey offers the most convenient access. Feature a reflective strip for added visibility. Pockets on this jersey also feature laser-cut holes for increased ventilation and lower weight as well as our esteemed ‘triple ramp’ concept, a strategic design that ensures your contents are secure no matter how high your exertion. Security pocket: An unobtrusive, vertical zip safety pocket added to the three lower panel pockets for the rider’s most important items, plus routing for headphone wires up the inside of the jersey. Bonded edges: Bonded zip, sleeves and waist for added refinement to the fit and improved aerodynamics. Enhanced safety: Added reflective visibility features for alerting other road users to your presence, incorporated without detracting from aesthetics.